It’s amazing how Monica Burke can transform paper and electrical components. She deftly combines vintage images with a modern cylindrical silhouette to create paper lamps that are at home in any décor. It’s not easy to blend vintage and modern elements, but she strikes the perfect, timeless balance. Monica became hooked on lighting restoration while working for a vintage lighting studio in Portland, Ore. On her days off she would rewire old fixtures and make lamps out of found objects. 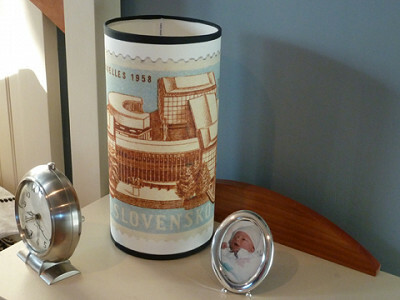 When she moved to upstate New York, Monica started designing her own paper lamps, using sturdy, archival cotton paper as her “canvas” for vintage imagery. She finishes the edges in grosgrain ribbon, and treats the cotton paper with a nontoxic flame retardant for safety. Old maps, postcards and stamps are part of Monica’s repertoire, and she mixes in nostalgic carnival scenes and mid-century modern themes, too. Some of her lamps use the element of surprise. With the typewriter design, for instance, a quote appears only when the light is turned on. Similarly, the Eiffel Tower is revealed in the backdrop of the tandem bike image, but only when the light is illuminated. It’s hard to choose a favorite -- each one is a work of art. Hello good people of Grommetland. My name is Monica Burke. I'm so glad you took a minute out of your day to have a gander at my handmade paper lamps. If you have any questions for me about my experience creating lamps or my two newest obsessions: Masterchef Australia and baking homemade bread, don't be shy - I love a good chat. Thanks again for stopping by! I'm sure I must be missing an option to click - but where is the list of quotes that are available for the wonderful typewriter lamp? I saw the authors' names, but not the chosen quotation. @Anne and Drea - I will pull them here as well. Good to have this information in two places! Do you have a website or just etsy? Currently my website is under construction but I hope to have it up and running in a few weeks, thanks! How the light switch work? In-line switch on the cord? Is there a way to make this into a 3-way light? Also, does this lamp accept low-wattage CFL bulbs? I have several lamps at home that, because of their design or size of harp, will only allow incandescent bulbs. There's an in-line switch on the cord and currently there is no three way socket option. The lamp has a candelabra socket so if you use a CFL in it you'd have to get one with that size socket. Thanks for your questions! 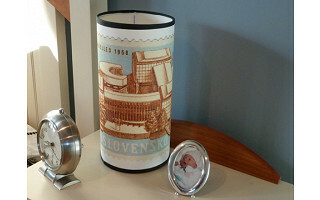 Do you do custom lamps, with un-copyrighted images that I supply? Images would be of Chrysler Building (background) and zoo animals (foreground). @Sundog: I can do custom orders but not during the holidays - I'm a one-woman shop so in order to keep up with regular demand I stop doing custom orders during November and December. Check back in January if you're still interested, thanks! @Monica Burke: Off-topic question, please email me when you have time. @Sara Coleman: Hey girl! Thanks for the endorsement - say hi to the family for me! They are 6" in diameter and 12" tall, thanks! I'm curious, can these lamps be used as a night light in childrens rooms. If so, are there any kids themed pictures or quotes for them. @Kevin: These are perfect for kids' rooms but you'll have to choose from the selections shown, maybe the rhino would look cute? Thanks! @Monica Burke: I am so excited to see you have one of my favorite quotes of all time, the one by Aristotle. I have been wanting to get something really special for my best friend, and it was part of my toast at their wedding. I'm saving my pennies! Tough choice! Can't decide on which quote: The appropriateness of the turning the light on and the quote of spreading the light, or Thoreau's quote. I love these! What size/wattage bulb do they take? @mcc: They have candelabra sockets and can take a 60 watt candelabra bulb max. If you wanted to use it as a night light you could put a smaller wattage bulb in it. Thanks! Just ordered the typewriter lamp (hey, I actually have that typewriter!) with the Edith Wharton light quote--just seems so appropriate. Looking forward to having it! Monica, these are beautiful. Will buy a couple as gifts -- can't decide which. Good luck with your (ad)venture! Oops-- just now reading the fine print. Will these ship in time for the holidays? @Kathy Cormier: Yes definitely! These are handcrafted so you should allow 6-8 days for them to ship...but Monica thinks that she will be able to get all orders out by Tuesday or Wednesday of next week. They will make fabulous gifts. @Liz: Oh no! We wish this lamp had arrived to you in perfect condition. I have contacted Monica and someone will be back in contact with you directly to resolve this issue. My apologies for the imperfection in the lamp - I'll send a replacement out to you tomorrow. Gave the type writer lamp to my niece and she loves it! It’s amazing how Monica Burke can transform paper and electrical components. She deftly combines vintage images with a modern cylindrical silhouette to create paper lamps that are at home in any décor. It’s not easy to blend vintage and modern elements, but she strikes the perfect, timeless balance. 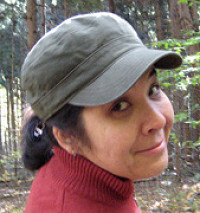 Monica became hooked on lighting restoration while working for a vintage lighting studio in Portland, Ore. On her days off she would rewire old fixtures and make lamps out of found objects. When she moved to upstate New York, Monica started designing her own paper lamps, using sturdy, archival cotton paper as her “canvas” for vintage imagery. She finishes the edges in grosgrain ribbon, and treats the cotton paper with a nontoxic flame retardant for safety.